Every now and then I get a wild idea, such as this months spending freeze, and decide to see just how far I can go to achieve success. This last week while walking outside to feed my new baby chicks I thought “I wonder if I could live a life of self-sufficiency like they do on the show Alaska the Last Frontier“. This prompted me to really take a look at my garden and all of the wonderful resources that I have around me already. Could I really make this work? My mind instantly began racing with all of the things that I would need to get done to make this happen. My garden will be the key to success here. The sad part is that my tiller met a pig last fall and it did not win. It is currently in at the local high school seeing what can be done, I will be thrilled if they can get it going again as my barter only cost me cupcakes and a pan of bars. The current state of my garden was weeds but after seeing a sign in town I was able to hire a nice local guy to come till it. His machine was MUCH larger than my own and in one hour he had gone over the entire area, twice! Plus he squared it off adding another four feet to my gardens length. Thank you Jimmy’s of Owatonna! So planting the garden, raising birds, gathering, harvesting, spraying, canning. I’m thinking with those things that take the longest to grow. Right now that would be my chickens. We are on week two with these birds and I am making sure that I fill them up 24/7. Their process day has been set and I only have a few weeks to go so growth right now is KEY to getting good sized birds for our winter eatting. With two growing boys even a half a pound more per bird is needed. My second thought right now is my asparagus bed. 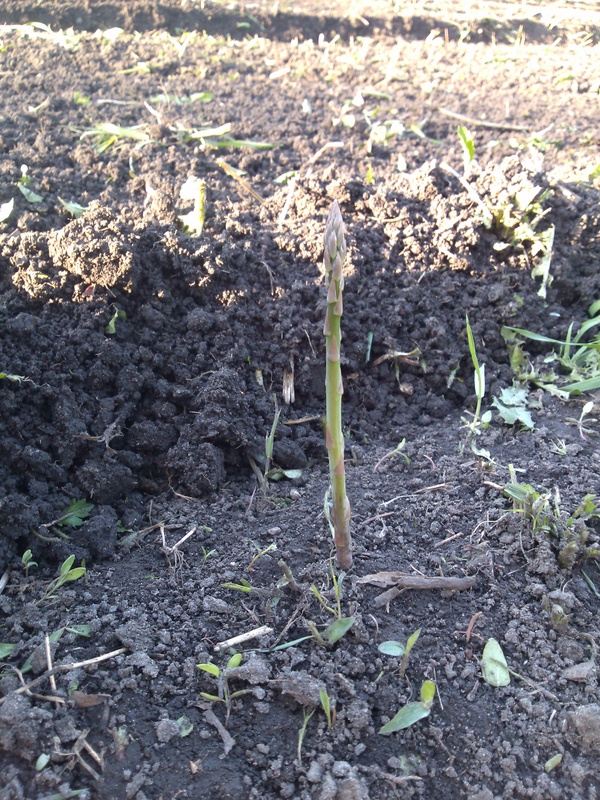 We are getting fresh asparagus daily now but not to the full potential that I know is coming. By the end of next week I am hoping to be blanching and freezing my first bathches of asparagus. My goal is at least twenty bags of frozen asparagus after that I will start to give it away to neighbors and family. I was blessed to have time this last weekend to put some already started plants into my freshly tilled garden. And thank God, truly so very much, the freezing 33 degrees predicted for tonight is now at 40. I know I would have cried if I had to start it all over. So here we go plants of all kinds are being inserted into the soil daily with lots of hope and big expectations. My goal is an hour a day all summer long. My question is will that be enough time and will I grow and preserve enough to feed us for a whole year? What are you growing this year? Any planting pointers? Happy planting!